ML-2A-HH-840-PU MAG-lite ML-2A flashlight with a HARD HAT HH-840-PU 3-3/4" purple smooth lockblade pocket knife in a presentation box. Price includes Laser Engraving of MAG-lite center grip and knife blade etch running charge. 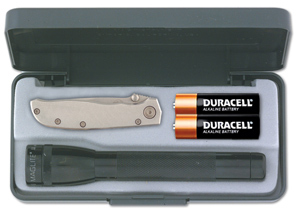 ML-2A-HH-840-PU, Combo includes MAG-lite ML-2A flashlight (choice of six colors), HARD HAT HH-840-PU 3-3/4" purple smooth lockblade pocket knife in a specially designed presentation box: 6-5/8" x 3-5/8" x 1-1/8". Box Size: 6-5/8" X 3-5/8" X 1-1/8"
Knife Handle 3/16 in. 1-1/2 in. Flashlight Center Grip 1-1/2 in. 2-1/4 in.